Chandragiri Hill day tour takes you through the Chandragiri hill station. Visiting Chandragiri hill by cable car was only recently opened to the public. Quickly it became a favorite day tour destination for all age for all tourist because there is about 10 – 12 minutes cable car ride to reach the top. The hill station Chandragiri is situated in the south-west of Kathmandu, at an altitude in 2,540 meters. 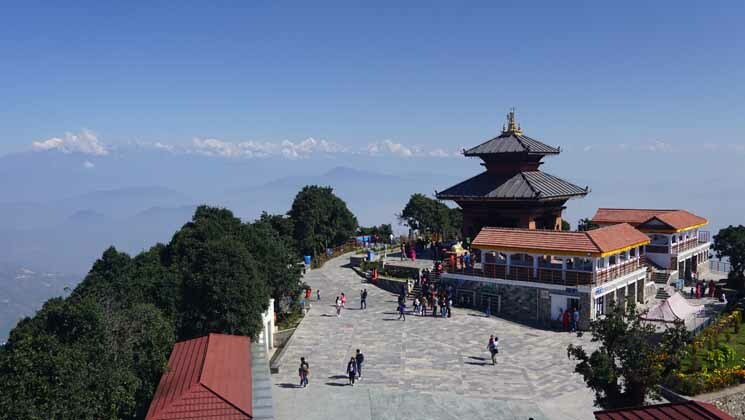 Valeshwor Mahadev temple is also located on the top hill from where you can see lush Green hills, you have a 360-degree view of the soaring Mountain ranges including Mt.Annapurna, Mt. Manaslu, Mt. Langtang, Mt. Ganesh Himal and many more. Mount Everest, not more than a dot can be seen from here in a clear weather. Besides that, you will have excellent scenery over the Kathmandu Valley, surrounded by its hilly terrain and magnificent Mountains. Chandragiri Hill has a significant meaning for Kathmandu valley. The legend tells that the great King Prithvi Narayan Shah was allured by Chandragiri hill station while returning to his Kingdom Gorkha from his maternal home in Makwanpur. Because of its beauty and the location, Kingdom Gorkha united all tiny states to what today is known as the greater Nepal. Being a combination of leisure and cultural, this tour guarantees its visitors full of fun. Day 2 Chandragiri Hill day tour ! After the pre-trip meeting, your sightseeing trip will start at around 8:00 am. You will have a private vehicle and a professional tour guide along with you. To reach Chandragiri cable car station, it takes about 60 minutes (1 hour) drive from the center of Kathmandu (Gongabu or Thamel). There is two option for your hiking either you go to the top hill by cable car as both way or by cable car until the hilltop and on your return, you might walk downhill through the lush green forest. However, this is just a day trip about 7 hours and we can design your travel plan according to your wishes. Most importantly, 90 % of visitors are choosing both way ups and down by cable car and only 10% of visitors are choosing cable car on ascending and walk downhill to get to the city. Thus, whatever you have options, this is just a day trip near Kathmandu. Note: if you want to extend your day hike you can consult with Ammar and you can spend few days there and keep walking other few days around Kathmandu valley hills like Kakani, Shivpuri, Nagarkot, Dhulikhel so on…. Early morning flight to Kathmandu. Drop you in Kathmandu International Airport onward your final destination and our trip ends. Wish you your wonderful journey!!! A professional licence holder government Tour guide while on tour. Lunch and Dinner during the staying in Kathmandu city tour. All types of drinks, bar bills, And your travel insurance. Discover the tallest mountains such as Ganesh Himal, Manaslu and Langtang Range of Earth. Majestic views of Kathmandu city and some of its heritage sites. Visit valeshor Mahadev Hindu Temple. No-money charged for a child less than 3 ft tall. The above itineraries are subject to change due to a condition beyond our control. This is just a Guideline showing tentative tour plan and stops. A physical, technical and natural condition may change this above itineraries. Amazing Chandragiri Hill day tour with my senior family members ! 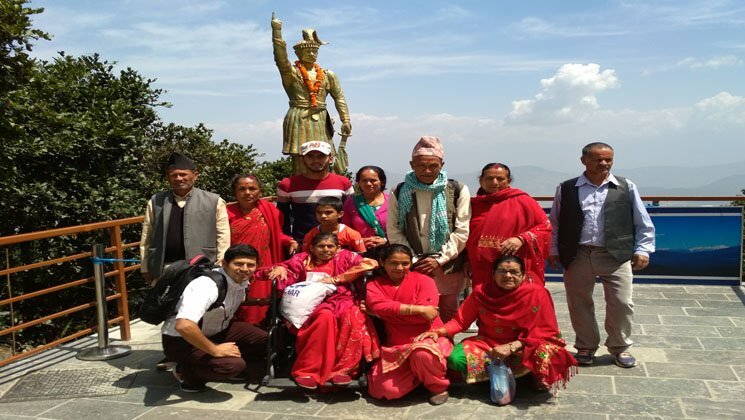 We are a team of 15 people and have booked Chandragiri Hill day tour for my senior family members with Gokyo Treks and Expedition Pvt Ltd. From the initial inquiry to the end of the trip the company was very impressive. Ammar (Company founder – Manager) was extremely efficient and answered emails and messages by return. We were extremely fortunate to have Ammar Guni as our Tour Guide. They were both extremely kind and always wanted to ensure we were safe and happy.